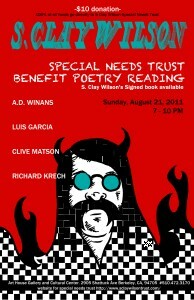 This is a poetry reading to benefit Wilson’s Trust. It’s being held in Berkeley on Aug. 21. at the Art House Gallery and Cultural Center 2905 Shattuck Ave Berkeley CA (510) 472-3170 7-10pm Be there or be square! This entry was posted on Monday, July 18th, 2011 at 12:14 am	and is filed under Uncategorized. You can follow any responses to this entry through the RSS 2.0 feed. You can leave a response, or trackback from your own site. Watch the mail as I’m sending a copy of a drawing you did for me in ’05. Just heard about S Clays situation yesterday from Ron Turner. I’ve been preoccupied for 3 years with serious health problems, but got a liver transplant 6 months ago,and am doing much better, there is a group called The Aphasia Foundation I think. I became aware of it due to Merle Saunders stroke. I can’t make it to the Event on Sunday due to a family party (my second one since the transplant) but will spread the info on the trust. Merles widow Debra Hall knows about the aphasia people and I could hook you up if you like. My phone # is 415-255-7134. 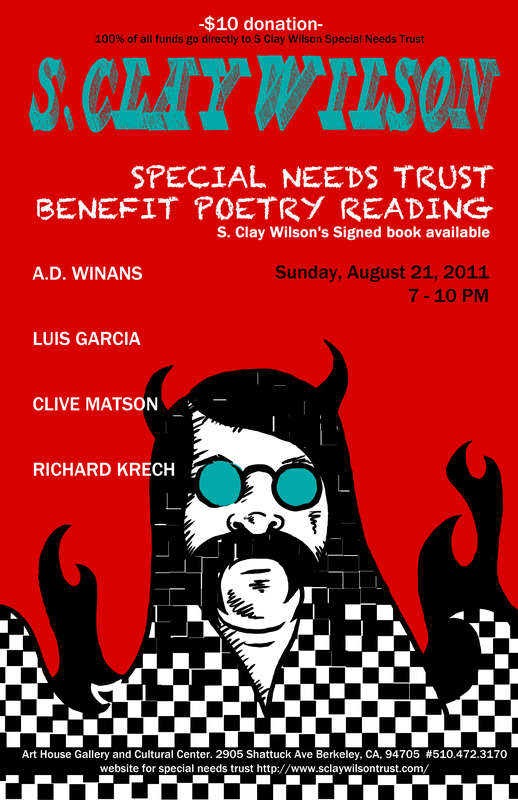 Blessings on Wilson for his irreverent art and stubborn spirit that keeps him with us. Steve and I were friends when we were at the University of Nebraska. We lived not far apart and spent many an evening drinking beer or cheap wine and talking. He gave to me an ink drawing called “the Metaphysics Professor” in 1965,I still have it. I have lots of memories of our times together with Bill, John, Doug, etc….we were all young with wonderful dreams…..